Oh, what a lovely keepsake for a very special child. 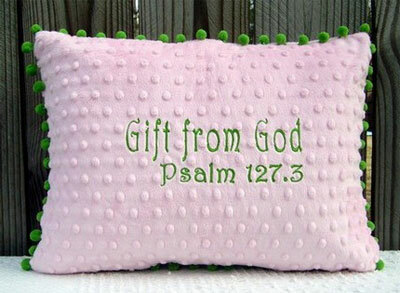 This super soft and cuddly minky dot 12″” x 16″” pillow is beautifully embroidered with “”Gift from God””, Psalm 127.3 and is trimmed with pom-pom fringe on all 4 sides. Envelope style sham opens in the . . ..
A hand-formed Crackle Glass Blessing Bowl gift set is designed to hold your written acknowledgements of the blessings in your life. 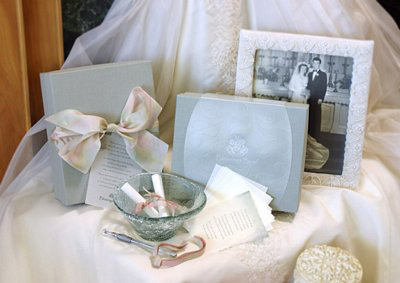 The elegant package includes the beautiful crackle Glass Blessings Bowl, a linen keepsake gift box with a poem card, . . ..